Image caption A BBC correspondent tweeted: "More commuter misery - Oxford Circus Tube always closes due to overcrowding about this time"
Oxford Circus Tube station was temporarily closed 113 times in the space of a year because of overcrowding, new figures have shown. The shutters were brought down on entrances a further 15 times for other reasons, including staffing issues and strikes, in the 12 months to October. Other major Tube stations Victoria and Waterloo closed five times and once respectively. Transport for London said it recognised Oxford Circus could get "very busy". TfL blamed the situation on modernisation work at neighbouring Tottenham Court Road and Bond Street stations. 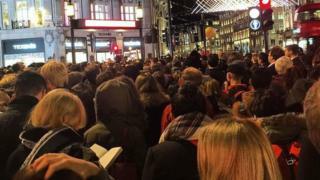 A statement said: "As part of this work, the Central Line is not currently stopping at Tottenham Court Road, meaning many customers have diverted to Oxford Circus." But the closures - amounting to nearly one every three days - during evening rush hours have frustrated shoppers and commuters using the station, which is at the busy junction of Oxford Street and Regent Street. One Twitter user asked: "When will Transport for London sort out overcrowding at Oxford Circus? Closed almost every day at rush hour." Following the terrorist attacks in Paris, another tweeted the overcrowding made "everyone jumpy". Minor closures were not included in the figures, released to BBC London through a Freedom of Information request. These include times when entrances were closed and stations only used for people to interchange and exit. TfL said these "partial closures" were "treated as 'business as usual' and usually only recorded locally, if at all". Oxford Circus is London Underground's busiest station, with nearly 100 million passengers entering or leaving the station in 2014. Stations are closed in order to "ensure that platforms are safe to use and there are not too many people on them," a TfL spokeswoman added. Tailor Thomas Church, 25, from West Hampstead, who uses the station every day, said the closures affected surrounding businesses. He said: "When it closes I have to cancel appointments and that means I lose money. It can cost us thousands of pounds every time. "What I don't get is that London is the world's favourite city and Oxford Circus is at the heart of it - so why hasn't it been upgraded to cope with demand?" London Mayor Boris Johnson was forced to defend TfL in response to the figures. "Oxford Circus is in line, as you know, for a huge improvement and don't forget that is one of the reasons why Crossrail is so vital," he told LBC. "That Central line, that whole network will be radically relieved by Crossrail when it comes in in a couple of years' time." A spokesman for watchdog London TravelWatch said the figures showed the "need for continued investment in capacity in the face of ever increasing demand". A July report from the watchdog recommended improving how interchanges are shown on Tube and rail maps. It said this could include making it clear where stations are a short walk apart, the interchanges that do not require additional fares and those that require passengers to leave the station. General Secretary of the Rail, Maritime and Transport Union (RMT) Mick Cash said the underground network was "bursting at the seams". "RMT is now receiving regular reports from our reps of severe overcrowding on both the tube and the commuter rail services," he said. "All the indicators are that passenger numbers will continue to surge, cramming more people into a capacity that is already at breaking point. "At the moment the transport authorities are winging it and that is a recipe for disaster. " Image caption Jonny Button said the closures were "a bit of a joke"
"I think it needs to be pedestrian-only. There's just too many people. People are walking in the roads, I just walked in the road myself. It's a bit of a joke," said Jonny Button. Image caption Isabel Cordwell said overcrowding "stops me getting home in the evening"
Isabel Cordwell, who works between Tottenham Court Road and Oxford Circus, said: "It stops me getting home in the evening. It's not at the same time every day so it's quite inconvenient. "But I'm not sure what can be done to change it - it's just the amount of people trying to get in and out." Image caption Rebecca Koczan finds the closures "pretty rubbish when you just want to get home"
Rebecca Koczan said: "It's pretty rubbish. Often I just walk to Green Park because I can't be bothered to wait. When you're coming home from work, you just want to get home and you can't because of what's happening." Image caption Bukky Bello said the overcrowding could be "quite scary"
"You can't get anywhere, can't get home quick enough and it's quite scary. Lots of people bump into you," said Bukky Bello. "It's a central place. You have tourists, shoppers, people coming from work, that's probably why."